Genealogy Research Bag - a Lifesaver! You've impulsively decided to spend the day at a local archives. Do you have all your genealogy must-have items packed and ready to go at a moment's notice? Or do you race frantically around your house looking for the binder that has notes you need for researching Great Grandma Elizabeth? Can't find any gum but you know you are going to need some? Pens! Pencils! Where oh where is a small bottle of aspirin just in case the microfilm reader gives you a headache. And on and on it goes, if you're like me you are breathless, sweating and slightly grumpy by the time you get out the door. And you're not really sure you have everything you need. My husband and I are avid antique hunters and we keep a tote bag in the closet with our antique hunting needs - small tape measure, pencil, small notepad, small package of kleenex (some of those stores are incredibly dusty! ), sanitizing hand wipes (you are touching lots of filthy items and have no idea what might be on them), Collection list of "have already" and list of "want", and a note that says "Don't forget books on coffee grinders, pot lids, etc" That reminds us to grab our books from the bookcase that show collections and prices. It occured to me last year that I could also start a Genealogy Research Bag. Whatever can't go in it ahead of time can be put on a list which is clipped to the outside, so I don't have to think about what I need. I can just read the list. My Genealogy Research Bag contains a small pack of kleenex; sanitizing hand wipes; small plastic ziplock bag with a tiny container of Tylenol (I'm allergic to aspirin), some anti-acid tablets and some throat lozenges; small plastic ruler; pens and pencils; yellow highlighter; small notebook; pad of lined paper; loonies and toonies for vending machines and parking (a loony is a one-dollar coin, a toony is a 2-dollar coin); pair of airplane sockettes (very thin, easy to slip on no matter what shoes I'm wearing and they keep my feet from freezing in overly air-conditioned buildings) and a list of items to grab before leaving the house. * GPS. Sometimes we forget to grab our GPS and can easily get lost if we're going to an archive or Library we've never gone to before. * Research Purse. That's my reminder to switch from a daily large purse to a tiny shoulder bag I keep just for antiquing or cemetery hunting or genealogy research. It allows my hands to be free, isn't heavy and holds minimal items. When my Flip-Pal Mobile Scanner finally arrives I will add it to the Grab List or put it in my Genealogy Research Bag. My Genealogy Research Bag is a life-saver. Hubs and I can decide on a moment's notice to go researching. I get the bag, check the grab list, call out the items to hubs which he collects and bingo we are out the door. Of course we do have to make sure both dogs are taken care of - that Barley is out in her run with a huge dish of water and that Webley is in his room with a bed, a toy and water, that the chickens and guinea hens are out of their pen, that our donkey has a carrot before we leave... but those are on our mental check-list every time we leave the house even to go grocery shopping! We can still be out the door within a half hour of deciding we are leaving. What a wonderful change from the days of scrambling around the house wondering where I put everything I need. Well, I've decided when my first Genealogy Day is going to be, and what ancestor I'm going to work on. Genealogy Day is the day I'm setting aside once a month to work on my own genealogy for a change! This Friday, October 1st is the big day! Hubs and I have each decided to take our first day as an organizational day. Each of us is going to choose an individual in our ancestry, and organize our notes, documents etc for that person. Then we are each going to come up with a plan for doing more research on that person. That will be our second Genealogy Day - an excursion to do the actual research. I've chosen my 4th great-grandfather Cornelius Vollick. Cornelius was the son of a Loyalist in Butler's Rangers, and may have been a Loyalist himself. I've got conflicting information on whether or not he too was in Butler's Rangers that needs studying. Years ago I acquired many petitions, land records and other documents regarding Cornelius but I need to go through them and study them for clues I might have missed first time around. I also plan to make a list of all petitions for Cornelius in the online Upper Canada Land Petitions Index. Part of my plan is to visit the new Ontario Archives building and get all of them again. I have them all but many are bad copies so I want new. Perhaps I missed one or two and if I did, this is my chance to get them. My land documents and notations for Cornelius desperately need organization. A quick glance last night showed me that I have a lot of land documents, but there is no order to them and I haven't studied them in depth to think about clues found in them. Cornelius is an important ancestor for me for two reasons. Without absolute proof that he is the father of my Richard Vollick, I can't get my Metis status back. I had Metis status but my tribe (Woodland branch of Ontario Metis Aboriginal Assocation) was disbanded (it's a long story!) and so I need to reapply through the Metis Nation of Ontario. They've already but accepted an application from a "cousin" so I know there is hope. However I descend from a different brother than my "cousin" does, so I have my work cut out for me. Cornelius is also important because I can't obtain my UEL (Loyalist) status without that same absolute proof that he is the father of my Richard Vollick. Hubs is going to talk about his plan for Genealogy Day on his blog AncestorsAtRest but without spoiling his blog post, I think he plans on organizing his records on his black ancestor Jonathan Butler, who settled circa 1840 in the Queen's Bush area of Upper Canada - a settlement area set aside for fugitive slaves. We are excited about this Friday and the first of our monthly Genealogy Days! Do you have your day planned? Are you a name collector? Just the names and dates of birth and death please! Or are you passionate about finding details on your ancestors? Do you want to see the factory where grandpa worked in 1930? Are you fascinated by a glimpse of the bridge over a river in the town where great grandma was born in 1882? I'm one of those who want as many details as I can find about each ancestor in my family tree. I drool over one tiny fact - for example the discovery of my grandfather (who died before I was born) listed in the City Directory for Guelph Ontario in 1917 as working for the Page-Hersey Co. sent me into raptures of delight! I had no idea what my grandfather did for a living. No one ever talked about him. My mother (his daughter-in-law) simply shrugged her shoulders when I asked and informed me that he'd been injured in a work-related accident in the early 1900s and never worked again. But she didn't have any clue where he worked or what he did. So finding this tantalizing entry was unbelievably exciting for me. But I didn't stop there. I didn't just enter that fact in my genealogy program under his name and carry on to the next ancestor. Instead I set out to find out more about this Page-Hersey Company. What did they manufacture? When were they in existence? Were they still around? A quick Google search for Page Hersey Company turned up some answers. More searching found images of workers in 1919 in the Page Hersey Co. in Welland Ontario and even though my grandad wasn't one of them (wrong town!) I now had a much better idea of what his workplace probably looked like. My next step was to start checking E-Bay on a weekly basis - maybe someone was selling some Page Hersey ephemera or collectible. And I want it to complete that one tiny bit of the picture of Grandpa's life. 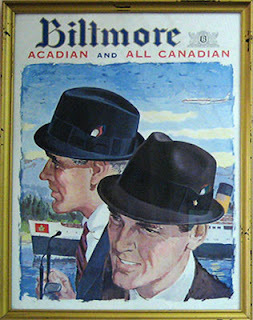 I've had some good luck in acquiring some blank cheques for the Biltmore Hat Co. in Guelph during the time my father worked there. I'm still on the hunt for more items! So far I've not turned up anything on the Guelph Lumber Company circa 1924-1941 where my other Grandfather was the manager, but I won't give up hope. Somewhere someday, maybe in an antique store or a flea market or on E-Bay, some little item will turn up. I also plan to visit the Guelph Library and the Wellington Co. Museum to see if they have any photos of that lumber company. I've found historic postcards on E-Bay that reveal much about a town where an ancestor was born. If they are reasonably priced, I buy them and include them as scans in my family booklets. Using census records I can find out street addresses and then use Google Street View to see the actual street where an ancestor lived, and if I'm lucky - the original house! And that's how I complete my ancestor pictures - or at least get a start on it! It's Movie Monday and this week's Movie is a Cemetery Walk through St. Michael's Catholic Cemetery in Orillia Ontario. There are 70 tombstones in this cemetery and we have 50 photos online with the rest to follow. There are 2 videos online on the OliveTreeGenealogy Channel on You-Tube. Video 1 is an overview of the cemetery grounds. Video 2 is a slideshow of photos of the first 25 tombstones as you start walking into the cemetery. There are also 25 photos of more tombstones in St. Michael's Cemetery online at AncestorsAtRest.com The rest of the tombstones in this cemetery will be going online as a Video this week. This older Cemetery is not well maintained, there's no parking and stones are tossed into the bushes. It's on the S. side of Coldwater Rd between Rynard Dr and Emily St. in Orillia. The newer St. Michael's Catholic Cemetery will be going online soon. It's important to note that present day Ontario had name and boundary changes, and was once called Upper Canada (and also Canada West). 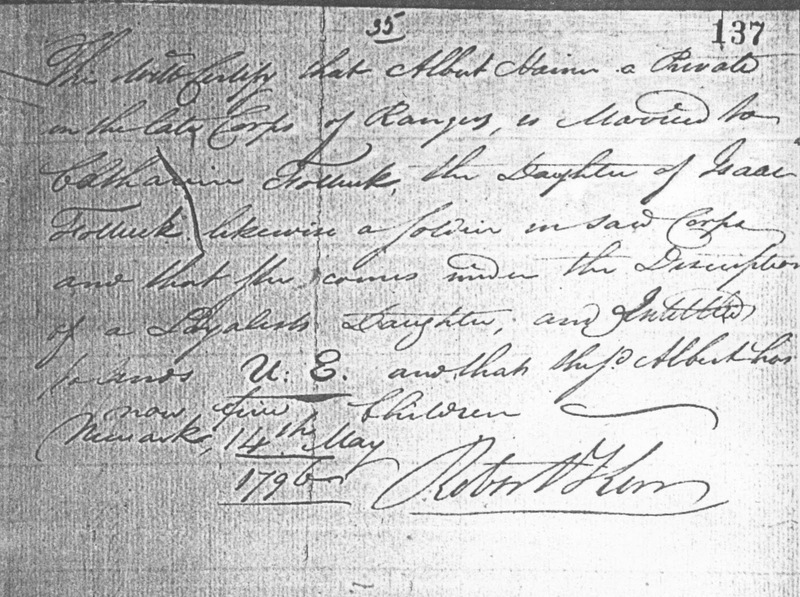 So if you are searching for early Ontario ancestors, you should not overlook the Upper Canada Land Petitions. The terrific news is that Library and Archives Canada (LAC) has just launched a new online database, Upper Canada Land Petitions (1763-1865). Caveat - this is NOT the petitions themselves, this is an INDEX to the petitions, with full details on where the actual petitions can be found for each individual listed. Through this online database, researchers can access more than 77,000 references to petitions for grants or leases of land created by individuals who lived in present-day Ontario between 1763 and 1865. This is an amazing new resource and one I'm utilizing already to double-check my previous searches of the microfilm in the Ontario Archives. With the online index you can use wildcards to represent letters, making it much easier to find all spellings of a surname. Using the microfilm index of course you cannot do that and must be very creative in your spelling! My husband and I love antiques. We love to go antique hunting. One of our biggest passions is to find items that have a name attached - whether that be a signed painting, an identified photograph, an engraved snuff box.... or other miscellaneous identified object. If we possibly do it, we buy the item and research the name. It doesn't matter that it's not our ancestor. We are dedicated to finding and saving lost items, then researching the family connected to that item. We try to post about as many of them as we can so that with any luck a relative or descendant will spot the article and enjoy seeing what we found. Lost Faces: Family Photo Albums is one of the examples of our quest to find such lost items and give them a prominent place online. But we also have items in our home that we enjoy on a daily basis. This large painted photograph is one of them. We know who this sweet young boy is and we've done research to find out more about him. Here is his story: Many years ago my husband's grandmother cleaned homes for elderly women in Perth County Ontario. One of the homes was that of a widow, Elsie Harstone. When Elsie died, the estate was put up at auction and my husband (then in his 20s) and his grandmother attended. 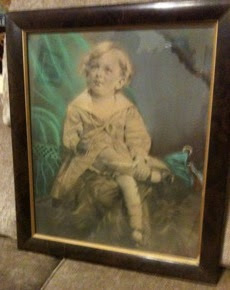 Up for auction was a large (2' x 2 1/2') tinted portrait of a young boy in an antique frame. It was taken circa 1900. On the back was written "Robert H. Harstone on his third birthday"
Hubby's grandmother told him the photo was of Elsie's husband as a young boy and that it had always been in the attic during the time she worked there. This may have been due to water damage in the upper right corner. My husband didn't want the photo to be lost or to go to someone who didn't know the family, so he bid on it and won it. We love this photo and have it hanging in our living room. I've done some research on Robert and his family, and have written it neatly on the back of the painting. That way when the painting goes on to someone else, they will have knowledge of the subject of the portrait. I've also added when it was purchased (that is, when it left Elsie's hands) and by whom. Future owners might add their own details and the painting will take on new life with each owner. Robert Hopper Harstone was born 22 July 1899 in St. Mary's Perth County Ontario to Leonard Harstone and Drucilla Beatrice Maude Windsor. Leonard Harstone was a lawyer. The marriage of Leonard Harstone and Drucilla Windsor took place in Toronto, York County Ontario on 22 March 1898 in the Church of the Messiah. See Harstone & Windsor Families of Perth and Essex Counties, Ontario for more details if you recognize this family. My former sister-in-law passed away on Saturday. I was 12 years old when Jeannette married my brother. I was so in awe of her! She brought so many new experiences into my life. I didn't have the greatest of childhoods and she brought me several moments of happiness which still linger with me. Jeannette, I often think about your toasted salmon sandwiches every Friday at midnight. Such a seemingly small thing, but so special to me. I remember when you went against my mother's wishes and took me to Oshawa to see the new movie "Psycho". I was so thrilled to be taken to the movies by my wonderful new sister-in-law! It was only the second time I'd ever been to the movies, and you bought me popcorn and a coke. I was so amazed that you chose to spend time with me and to give me a wonderful day out. Even though my mother was right in that I was terrified and had nightmares for weeks afterward, the memory of that day with you is still special even after 50 years. I remember driving back late one night from Toronto, sitting beside you in the front seat of the car. It was winter and you were wearing a big faux fur coat. I was sleepy and you told me I could put my head on your shoulder and go to sleep. I doubt you knew what that meant to me, but it's another treasured memory I carry. I didn't do it as that kind of physical closeness was something my family never did, but I longed to. I don't recall ever being told I could snuggle up to anyone before you offered your shoulder! You showed me how to design and sketch clothing using paper dolls. It sounds strange now I know, but for my artist soul that opened a whole new world for me. I spent hundreds of blissful hours designing clothing for those silly paper dolls, an activity which offered me peace from a less than pleasant home life. I'm so glad I had a chance to see you again last year (after more than 30 years!) at my mother's memorial service. I didn't recognize you at first but you recognized me and we had a big hug. I still remember the first words out of your mouth "When did you get to be so tall!" We had a lovely chat and that's another memory I'll cherish. But I wish I'd told you of those special moments with you when I was young. Thank you for the joy you brought me as a young girl. This song is for you. You had serious health problems for many years of your life and I hope you've reached that peaceful valley. It's Movie Monday on the Olive Tree Genealogy Video Channel on YouTube! The Flora MacDonald carried passengers from Ireland consisting of 131 men, 125 women, 40 males under 14 years old, 44 females under 14 years old, 6 infants under 1 year old for total of 347 passengers. One child was born on the voyage. Four passengers died - their exact dates of death are noted beside their names on the manifest. More Cemeteries are coming online on the Olive Tree Genealogy Video Channel , as well as more ships passenger lists plus other genealogy goodies so stay tuned. Do you take time to work on your own personal genealogy? If you're like me, you're involved in so many projects and daily family life that you don't seem to get around to it. It's been months since I did any research on my ancestors. I miss it! But like many other genealogists, I have my blogs, my websites, my mailing lists, my Olive Tree Genealogy newsletter, the family history books I write, articles I'm working on... and a whole slew of other genealogy projects - none of which are specifically about *my* ancestors! And that doesn't include family life - cooking (which is my second favorite activity after genealogy! ), antiquing (next favorite after genealogy), spending time with kids, grandkids, hubby and friends. Wow I'm exhausted just writing this all out! Oh yeah and I'm not retired so I have to engage in that dreadful 4-letter activity - (W O R K). Don't get me wrong, I'm not complaining. As I always say to hubs, it's not a complaint, it's a statement of fact. I love what I do. But it fills my days. So today I decided I need to take time for my own ancestor research. With that in mind I've set aside one day a month - marked on my calendar so I can't pass it by in favor of "more important" or "more urgent" things.... That one day is designated GENEALOGY DAY. Now, every day is Genealogy Day for me, but this one is to be spent only on my ancestors. On Genealogy Day hubs and I will make field trips to various archives, libraries, museums - the places we keep meaning to get to (but never do) to look up our ancestors. Some are near, most are a fair distance. For example I have been needing to get to Erie Pennsylvania for years now! I need to have a look in the Archives there for my PEER family who lived in Northeast Pennsylvania and just across the border in Ripley New York from about 1817-1835. We might forgo a field trip in favor of staying home and organizing a family line, sorting documents for one individual or family group. Then we can construct a plan of attack - what do we have and what do we need? Taking the time to decide on what is needed and finding out if it has survived and is available, then doing some checking to find out where it is held will be invaluable as we plan our field trips. I'm looking forward to our first Genealogy Day at the end of this month! We haven't decided where we'll go but I suspect to the new Ontario Archives. For that we'll need a really good plan of what we each want to find, as both of us are at the challenging part of our Ontario ancestors research. I'm finding that it's too easy to let my own genealogy research slip in favor of other projects. And while I love working on all these other things (they're mostly genealogy, just not my own! ), I miss the thrill of the hunt, the excitement of the find. Time to recapture that moment of absolute delight when you finally find that little tidbit of information that gives you the maiden name of your great-great-great grandmother... or the will of your 3rd great grandfather. So watch out Levi Peer, I'm coming to find you! This unique and one-of-a-kind project reconstructs the names of passengers on board ships sailing from Holland to New York. The Dutch ships did not keep passenger lists as we know them. So all that exists are the accounting records of the WIC (West Indies Company) - and only the debit side, that is, the names of passengers who still owed money for their passage. Every new name of an individual is added to the ship, and the exact source is noted. As new sources and new names are discovered, they are added as well. Welcome to Part 3 of a 12 month series about finding and using less obvious genealogy records to find ancestors. The Upper Canada Sundries are an invaluable genealogical resource but many researchers have never used them. The Upper Canada Sundries, aka Civil Secretary's Correspondence are found at LAC (Library and Archives Canada) and at the Ontario Archives. They consist of 32 volumes on 14 reels of microfilm and are an assorted collection of, as the name implies, correspondence. The main responsibility of the Civil or private Secretary to the Lieutenant Governor was management of correspondence. The Secretary ensured that it was acknowledged, referred onward or filed. Closely related were the duties of receiving and acknowledging Addresses, petitions, memorials and applications for office; transmitting Messages and public documents to the Legislature; and referring petitions to the appropriate public offices for opinion or advice prior to submission to the Executive Council. Although the province of Upper Canada did not come into existence until 1791, supporting documents of earlier date have been incorporated into some series of its records. The Sundries are filed chronologically. There is no name index but the wealth of genealogical information makes them worthwhile to browse through. They contain an assortment of such genealogical items as undated petitions, marriage certificates, land records, letters, petitions for land, testimonies during wartime, military records, petitions for mercy for those charged with treason, etc. 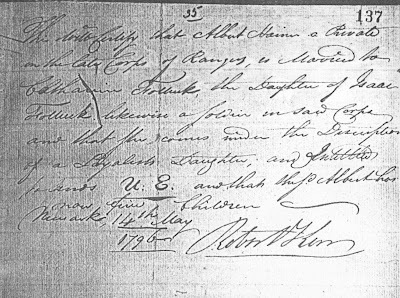 This will testify that Albert Hainer a Private in the late Corps of Rangers [referring to Butler's Rangers, whose disbanded soldiers settled the Niagara area of present day Ontario], is married to Catharine Folluck [sic. More commonly written as Vollick or Follick], the daughter of Isaac Follluck, likewise a soldier in said Corps and that she comes under the description of a Loyalists Daughter, and is entitled [can't read next word] U.E. [Unity of Empire, a title applied to Loyalists once they were accepted by the Council and officially declared a Loyalist] and that said Albert Hainer now has five children. Dated Newark, 14 May 1796. Source: FHL 1683290 p. 137 of Civil Secreatry's Correspondence, upper Canada, Upper Canada Sundries 1791-1800 RG5 A1 Vol. 1A pp41-556. This leads me to more research - I would now hunt for petitions for both Isaac Vollick, his daughter Catherine and her husband Albert Hainer. They should all have applied for land as Loyalists and their petitions should be found in the Upper Canada Land Petitions. Olive Tree Genealogy Has Its Own You-Tube Channel! hI finally got around to setting up an OliveTreeGenealogy Channel on You-Tube. So far I've managed to upload some cemetery videos, and am working on more! I've been thinking about doing this for a long time. Last June hubs and I stopped at several cemeteries during various road trips. He did the work of walking and filming short videos of the tombstones, while I took digital photos of as many of the tombstones as I could manage with my physical challenges. My plan was to upload the videos to You-Tube for researchers to view and look for an ancestor's tombstone. So today I set up my channel for Olive Tree Genealogy and uploaded some videos. One of the videos is from photos I took of a cemetery, then made into a movie using Picassa. It's a bit of work, especially since You-tube is new for me, but I think it's really going to be fun. And I hope worth it for researchers to keep checking to see if a cemetery they are interested in is on my channel. Join me at http://www.youtube.com/user/OliveTreeGenealogy to have a look! You can subscribe to my channel by clicking on the SUBSCRIBE link on my page. And stay tuned for lots more videos coming online. I can hardly wait to get to the pictures we took in Massachusetts! I'm going to make a movie (slide-show) from them and upload those to the channel as soon as possible. Everyone dies. It's a sad fact of life, and one we all face. For genealogists this natural order of things is compounded by the fact that we have invested so much time into researching our family tree. What will happen to our years of work once we're gone? As we've discussed previously on Olive Tree Genealogy blog, genealogy is often a way of life, an addictive all-consuming hobby or avocation. If you're like me you have boxes and binders and filing cabinets chock full of papers and documents you've collected on your ancestors. But do you have a plan for your papers after your passing? You not only need a person or repository for your work, you need to have it in some semblance of organization in order to pass it on. Let's face it, do we really think anyone else wants our piles of unsorted papers? I can't think of anyone in my family who would offer a spot in their homes for my records. I have two 3-foot long filing cabinets, 3 drawers high - the kind that pull out so the files are sideways not facing front. I also have 2 smaller front-facing filing cabinets. I also have several large plastic tubs. They are all full of my genealogy research. I'm only kidding myself to think that anyone would take them and give up room in their house to store them. And let's not forget my Genealogy program with data entered that is not printed off. I'm not even sure my husband knows how to access all those digital family files. 1. Where will our work go - an individual family member? An institution? Many genealogists seem to think that an institution such as a local library or an Archives or Museum or the Family History Centre in Salt Lake City will jump at the opportunity to have the research. But have you verified that this is correct? Have you found out what format they want it in, IF they want it at all? Do you know of an enthustiastic family member who is hoping you'll leave all your research to him or her? I don't! My plan is to continue creating small family booklets which I've talked about previously on Olive Tree Genealogy Blog under the topic Genealogy Memory Books and also larger in-depth books. In each of those I will place scans of documents I've found. It isn't realistic to think I can include scans of every single document for every individual - the census records alone would create a book so mammoth it would not be feasible to print it. So I will note my sources carefully and accurately so that others reading my work will be able to duplicate (i.e., find) what I have found. I'll only be able to include scans of the more obscure documents, and of those which are original one-of-a-kind documents or photographs in my possession. I hope to create these booklets and donate them to local libraries during my lifetime. I plan on one booklet or book per family surname. For family lines where I've not yet done in-depth research I will simply put together a very small booklet with a pedigree chart, family group sheets or genealogy report printed automatically from my genealogy program, and copies of documents. These I won't donate during my lifetime but will add to them as I can. Instructions for disposal of my genealogy research notes and booklets have been added to the set of instructions I have for the executors of my will. Both my husband and my son know where this is kept. It's a large manilla envelope with several pages of important items - my bank accounts, credit cards, burial wishes, facts for my obituary, my wishes for disposal of family treasures, life insurance policies, etc. Everything to make my executors' lives easier. I rest easy knowing I have a plan that I like. But I haven't yet begun organizing the genealogy data and that leaves me feeling uneasy. Genealogy is important to me. The truth and the story of my ancestors is something I am compelled to pass on to others. Facing our own mortality isn't easy but it's inescapable and so I've vowed that 2011 will be the year I organize my over 40 years of research. Do you have a plan and a goal for ensuring that your genealogy research survives? What a wonderful legacy we can each leave if we take some time to make it happen. Crime and Punishment in Upper Canada: A Researcher's Guide, is now available. Have you ever wondered about who kept the peace in Upper Canada? What happened if someone stole your ancestor's horse? Did your ancestors ever have to serve on a jury or testify against their neighbours in court? Did they work for the district government as a clerk, sheriff or jail keeper? Were your own ancestors ever drunk and disorderly, or worse? Crime and Punishment in Upper Canada: A Researcher's Guide covers all these topics and more! You'll learn about the early Ontario justice system: the laws, the crime statistics, the court system and the punishments. You'll meet interesting characters - from Justices of the Peace to petty (and not so petty) criminals.And you'll learn about the records you can use to discover your own ancestor's stories. Here's a scenario that I suspect will be familiar to most genealogists. You receive an email from a stranger who excitedly writes that she is descended from the same ancestor as you. Your common ancestor was born in the early 1800s. Your new "cousin" goes on to say that her great aunt Martha always said that Common Ancestor was Irish so she isn't sure why you are saying on your website that he was of Dutch descent. She goes on to add that she is new to genealogy and has been researching for one year but has a "ton" of information from great aunt Martha. You've been researching this family (including Common Ancestor) for over 30 years. You've carefully scrutinized and assessed various records. You've cited your sources. You've searched in obscure record sets for every scrap of detail no matter how small. And nowhere does any hint of Irish or Ireland come into play. You don't have an exact town of origin for Common Ancestor but you have miscellaneous records (census, obituaries, death records etc) that indicate the family's ethnicity was Dutch. Thorny question - how do you convince your new "cousin" that she's wrong. I've encountered this many many times over the past dozen or more years. I've tried explaining the contrary evidence that substantiates my research. I've tried various methods - the long-winded explanation/argument, full of examples and source citations. All I usually get back is "hmm that's not what great-aunt Martha told me"
I've tried the short version - "The family is definitely Dutch in origin as shown on census and land records. Perhaps the notion of them being Irish came into being with the marriage of Common Ancestor's son to Sally O'Brien who was from Ireland" I've explained that family lore can't always be trusted to be 100% correct. Still no agreement from "new cousin" that my research findings might in any way have merit. Second thorny question - is it necessary to convince "new cousin"? I've done good research. I stand by my findings. Is it enough to simply present her with those findings and let her draw her own conclusions? Even if she continues to argue that great aunt Martha TOLD her the family was Irish, ergo they are Irish - is it my responsibility to try to convince her of the correctness of my research and the error of hers? Perhaps it's enough for me to simply state that the evidence I have found indicates the family was Dutch in origin. Enough said? Maybe I need to back off and let "new cousin" think whatever she wants? Sometimes I feel like responding the way my 12 year old grandson does when his sister keeps arguing with him over something he knows absolutely is incorrect thinking on her part. His ending comment is "Well, you can think that if you want but it's wrong"
So now I've come to wonder if it is up to me to convince any other genealogist of the "rightness" of my research. Should I shrug my shoulders and let it go? Or should I continue to attempt to convince a new cousin of the thoroughness of my research? I'd love to hear thoughts and opinions on this! This Press Release from FamilySearch is very interesting. The classes offered sound worthwhile for genealogists. SALT LAKE CITY–As students all over the country head back to school, family historians also have the opportunity to learn­–but they can do it from home at their convenience. Midwest Genealogy Center librarian Janice Schultz agrees that partnering with FamilySearch increases their reach. All of the classes can be accessed on http://www.familysearch.org/ by clicking on Free Online Classes on the home page. My father died when I was just barely a teenager. I never knew that much about him (as odd as that might sound) - what he was like as a person, where he worked, what his hobbies were .... To me he was just "dad" and I knew him as a father, not as a brother, a son, a friend, or a co-worker. My mother never talked about my dad so I didn't know what he did for a living when they were first married, or how they met. I knew bits and pieces but those bits and pieces were vague half-memories formed while listening to my father when I was very young. He worked in "the city" (Toronto) for Veteran's Affairs. I knew that much. He loved to fish and every fall he went hunting, always coming home empty-handed. He never talked to me about his childhood or growing up in Guelph, and when i asked about his time in England in WW2 all he ever revealed was that he was in the Signal Corps and, in his words, "swung through the trees like a monkey"
So it was a very nice surprise to find from his WW2 Army Service Records that he had worked at Biltmore Hats in Guelph before joining the army. I received those records about 15 years ago and ever since then have been trying to find some ephemera or item that has something to do with Biltmore. I'm an avid antique collector and often see the Biltmore Hat boxes. But they're fairly large and cardboard, usually in bad shape and not really what I want in my house. Last month I stumbled on a website called Antiquarius Booksellers based in British Columbia. Much to my surprise they had two older, unused cheques from the 1940s from Biltmore Hats of Guelph, Ontario. Can you imagine my excitement? That is just slightly later than when my father worked there! There was even a picture of the Biltmore Hat building (which I'd not been able to find previously) engraved on the cheques. It goes without saying that I purchased them. And at a very reasonable price! I'm so pleased with my purchase. The cheques arrived promptly and are in perfect condition as described. They were beautifully packed for shipping. Now I have a nice page to add to my pictorial history of my McGinnis family. I'll write up an explanation of dad's working at Biltmore Hats and add these scanned photos of the two old cheques and the ad for Biltmore Hats that I found previously. And now I have a more complete picture of my father the person, not just my father as dad. Thousands of pages of Victorian workhouse and poor law records have been made available online following the conclusion of a major project led by The National Archives. Brian, of AncestorsAtRest, has a nice collection of Funeral Cards and Memorial Death Cards online. Funeral cards are an overlooked genealogical resource. They often contain both the Birth date and Death date of an individual, and sometimes information about burial or funeral services is also provided. Some Funeral Cards contain photos of the deceased. Funeral cards were meant to be sent out to family and friends to let them know an individual had died, and to inform them of funeral arrangements. Memorial cards were just that - a card sent out to family and friends in remembrance of a loved one's death. For help finding other death records when you can't find a death certificate, the free Ancestor Death Record Finder may be of help. Lots of good tips and links to help you find alternate death records. Yes, to be a good genealogist you need to be a copycat. Each of us must be able to accurately transcribe (copy) what we see on a document! It's crucial to write down (copy) exactly what is on that document, not what we THINK we see, or what we EXPECT to see, or what we HOPE to see, but what IS ACTUALLY THERE. That means if you find Great grandmother Sadie in a census but her name is recorded as SADY, you should copy it EXACTLY as it was written originally! It's okay to make a note that Great Grandma wrote her name as Sadie on every single record you've found other than this census. If you find your auntie Sybill in the census but her name is recored as Cybell - copy what you SEE not what you WANT to see! Yes, the census taker probably spelled it incorrectly. But far be it from us to change that original record. If the record is indexed incorrectly that's okay to ignore that. You don't want to carry on an error made after the fact. When you find an incorrect index entry, check the original and copy what you see there. When viewing an original record, be careful to copy it accurately. Being a copycat also applies to your genealogical correspondence. One of my pet peeves is hearing from other genealogists who mis-write my name. My name is Lorine yet I often receive emails from people addressed to "Lorraine" or "Lori". Neither of those are my name. In fact Lorraine isn't even a mis-spelling of my name, it's a completely different name completely! My name is on the bottom of every email I send out. It's on all my websites. What does this say about the genealogist writing to me? That they cannot copy correctly, that they write down what they EXPECT to see (Lorine isn't a common name), or what they THINK they see... I often wonder how accurate (or inaccurate) they are when copying down records pertaining to their ancestors. We all make errors sometimes. A slip of the pen, a lapse of concentration and we've changed what was on an original record without meaning to. And that is why it is wise to double-check and triple-check your work. Be careful, be a copycat, and be sure you are writing down what you find, not what you expect to find. Hey genealogy buffs sitting there in your pajamas (or whatever) on a Saturday Night - it's time for more Genealogy Fun! 1) Create a Title and outline an episode of your own Genealogy television show. Be funny, crazy or serious, it doesn't matter! 2) Tell us about it in a blog post of your own, a comment on this blog post, or in a status or comment on Twitter or Facebook. I'm taking Randy up on the challenge and have created my Genealogy TV Show called LEAVE IT TO SEAVER. My TV Genealogy show is loosely based on the 1950s TV show LEAVE IT TO BEAVER. 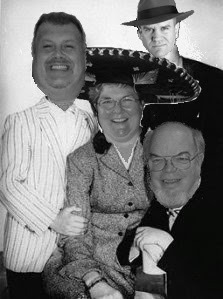 Here is a photo of the Cleaver family - Ward, June and sons Wally and Theodore aka Beaver. 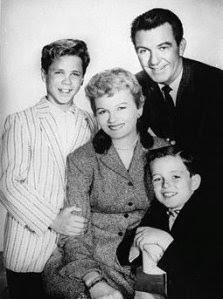 in my TV Show LEAVE IT TO SEAVER, the family is an all-American genealogy-loving family living in Ohio consisting of wise father Wart, loving mother July, 12 year-old son Tomally and 8 year-old son Seaver. I've chosen four popular Genealogy Bloggers and well-known Genealogists as my cast. I'm not going to name them but here is the cast photo. I wonder how many you recognize? On the left in the striped jacket is Tomally, with his mother July in the middle. 8 year old Seaver is bottom right and father Wart is standing behind the family. Seaver has been given a project by his teacher Miss Familytree. He has to create a 5 generation pedigree chart starting with himself. Seaver would rather play baseball but he knows he'll be in big trouble if he doesn't get this done. So when he gets home, he asks his mom July. July is in the kitchen baking chocolate chip cookies and tells Seaver he'll have to wait for his father to come home. When Wart gets home from work he sits down with Seaver and tells him all the great stories of their ancestors - the great grandfather who had their name changed at Ellis Island; the great great grandma who was an Indian princess, and how they are descended from Charlemagne. Wart offers to show Seaver the family bible that was snatched out of the fire by their 5th cousin 7 times removed after Indians tossed it on the flames. Seaver is impressed and goes to the room he shares with big brother Tomally. He makes his 5 generation pedigree chart and tucks it under his pillow. Big brother Tomally slicks back his hair in front of the bathroom mirror and dispenses friendly big brother genealogy advice "Hey Seave I wouldn't talk much about this genealogy stuff at school. The other guys won't like it. This is kind of private stuff that only the family talks about"
Seaver throws his pillow at Tomally and the goof around for a bit. The next day, ignoring Tomally's advise he starts bragging about his famous and exciting ancestors. Another boy in his class mocks him with a standard genealogical insult "Oh yeah? My 5th great-grandfather can beat your 5th great grandfather with one hand tied behind his back!" They start a shoving match. Tomally's obnoxious friend Freddy Rascal runs over and urges the boys on. Seaver's shirt is ripped and then the fight is broken up by his brother Tamally. Seaver finds himself in the principal's office where he has to explain his entire genealogy to his principal. The principal's eyes glaze over and he phones the Seaver home. July is horrified and promises that her husband Wart will take care of the problem when he gets home from work. Wart comes home from work, sits Seaver down and provides his usual genealogy wisdom. "Now son, there will always be others who are jealous of your royal ancestors, jealous that we have traced our family back 26 generations and jealous that we have over 75,000 names in our family tree database on FTM. But the wise genealogist ignores that and concentrates on the important things - making sure sources are entered correctly, breaking down brick-walls and sticking to the course of finding out female ancestors maiden names. Don't ever forget that son"
Tomally wanders into the room and gripes "Gee dad I never knew that, how come you never told me the rules of being a good genealogist? And you gave him a 5-generation pedigree chart? Seaver's so lucky!" Wide-eyed, Seaver says "Gee Dad, what's a guy gotta do to get a 6 generation chart?" July enters the room, tells the boys to run along, then leans over and whispers to Wart "Maybe this weekend we can spend some quality time together and trek around local cemeteries" Wart gives her a thumbs up and smiles then calls the boys back into the room. The show ends with July passing out homemade fudge made from her grandmother's secret recipe. This Michigan history resource looks really good. I played around in it for a few days last week and found some very interesting data. I especially loved the biographies section. But what I found most intriguing (and useful!) was the online book called "The emigrant’s handbook, and guide to Wisconsin, comprising information respecting agricultural and manufacturing employment, wages, climate, population &c. : sketch of Milwaukee, the queen city of the lakes : its rise and progress : business and population : list of public offices, with a full and accurate table of statistical information of that and other ports on lake Michigan : also, table of routes from New York, Boston, &c. ..."
It was fascinating and even though the focus was Wisconsin, it gave me a much better idea of what my ancestors faced on leaving their homelands and sailing across to America in that time period. The table of routes was invaluable and I'd most likely not found it any other way. Farmington Hills, Mich. – Michigan eLibrary (MeL), and Gale, part of Cengage Learning, announced the launch of Michigana, Sources in U.S. History Online, an online resource providing access to primary source documents and contextual essays for the study of Michigan history. Michigana: Sources in U.S. History Online contains valuable and authoritative content packaged with an engaging user interface, allowing students and researchers multiple ways of accessing historical information. Michigana: Sources in U.S. History Online provides access to primary source documents in an online system that is easily accessible by students and researchers of all levels. For example, a user may enter a search term such as Fort Mackinac to find all references to that word or phrase found on any page within the database. Or a student may choose a subject term from the listing of top subjects that are listed on the home page to quickly find all works that are closely related to that person, place or event – for example, William Hull or railroads. Another way to access the content is through contextual essays that have been written by Michigan historians specifically for the database. These are accessed through the images at the bottom of the home page which take a user to a list of related essays, all of which include a bibliography of related documents from within the database. “We are excited to have Michigana, Sources in U.S. History Online added to Mel.org. We know that researchers of all ages and who are interested in various depth of coverage will find the information useful. From students simply having fun digging for fun facts, to college students writing in-depth research papers, to genealogists tracking down family history, this resource is invaluable,” said Deb Biggs Thomas, the Library of Michigan’s MeL Coordinator. MeL is a project of the Library of Michigan in partnership with all Michigan libraries and supported by federal Library Services and Technology Act (LSTA) funding. Through MeL, Michigan residents can access electronic resources such as Academic Onefile, Kids Infobits, Educator’s Reference Complete, Business and Company Resource Center, General Business-File, InfoTrac Custom Newspapers, the New York Times and e-books on all aspects of general reference. If you missed Season One, NBC is airing the four episodes of the original Who Do You Think You Are? series starting on Friday, August 13 at 8/7c. USA Immigration Records FREE for Labor Day Weekend! Terrific News! This Labor Day Weekend, Ancestry.com 's entire USA Immigration Collection is free. That's all their Ships Passenger Lists. You can access the collection by clicking on the START NOW button on the image on the left of this blog post. PRESS RELEASE from PROVO, Utah, September 1, 2010 /PRNewswire/ .— Ancestry.com announced today it has launched a collection of more than 1,700 recorded oral histories from immigrants who arrived in the United States through Ellis Island. This is the first time this collection of poignant recordings has been available online. To celebrate the new addition, Ancestry.com is making its entire U.S. Immigration Collection free through Labor Day. Other Records Added to the Ancestry.com U.S. Immigration Collection: The Ellis Island Oral Histories are the latest addition to Ancestry.com, which boasts the world’s largest online collection of U.S. immigration records. Comprised of more than 170 million records, the Ancestry.com U.S. Immigration Collection includes lists of passengers who immigrated by ship to America between 1820 and 1960, including those who came through Ellis Island; more than 7 million citizenship and naturalization records; border crossings, passport applications and more to help reconstruct our ancestors’ journeys and early lives in America. I've heard good things about this scanner, and I loved that it is small (10.25 x 6.5 x 1.25 inches), easily carted around (weighs less than one pound), and scans in an area 4x6inches. It will scan larger documents or photos and has stitching software to merge larger items into one. Flip-Pal Mobile Scanner is cordless, battery powered (I love that idea!) You can set it for 600 and 300 dpi resolution which is plenty for my genealogy scanning needs. I'm excited to see it, try it and use the stitching software program for larger scans. I'm really excited about this portable scanner and can't wait for it to arrive. Oh and I almost forgot to mention, it was only $149.99. Fingers crossed that it arrives soon! Lisa made an interesting comment in response to my post called It Boggles My Mind which is a blog post about how I find it incredible that there are people who are not the least bit interested in their family history. Lisa disagreed with me when I referred to genealogy as a hobby. "I disagree on one thing you said though, this is NOT a hobby. It is much more than that. I call it my life's work. We are writing and preserving history and without the genealogists of today, much will be lost tomorrow. " Lisa has a good point. I agree that we are writing and preserving history (as well as finding facts). I agree that genealogy is important. But is it indeed a hobby? Or something more ... what else can we call this activity we engage in? A hobby is defined as an activity or interest pursued outside one's regular occupation and engaged in primarily for pleasure. * I pursue genealogy in my spare time. * I research my family tree for pleasure, not profit. * I am passionate, perhaps even obsessed about my ancestors and genealogy. * Research into my Genealogy is not my full-time job. It seems to me then that my pursuit of genealogy fits the definition of a hobby. I don't believe that applying the term "hobby" is necessarily negative. I don't think that calling an activity a hobby is demeaning. The common pre-conception may be that a hobby is little more than an entertaining distraction from life, but that's not an accurate definition. As far as I'm concerned, if you don't pursue genealogy as a full time "JOB" which pays your bills, then it's a hobby. It can be a passionate, all-consuming hobby. It can be, as Lisa says, your life's work. You can be 100% committed to finding and preserving your family history. But if you are paying your bills by working at some occupation other than genealogist, you are engaging in a hobby. I'm interested in what others think. Do you have a good word for what we avid genealogists engage in? I'm open to suggestions for a term other than "hobby" but until I hear one that fits, I'm still going to say that I have a hobby I love, called genealogy. It's my passion, it's all-consuming, and I think it's incredibly important to find and document my ancestral trail, but in the end it's my hobby.